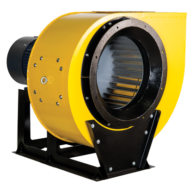 High capacity radial industrial fans with medium pressure. Stationary extraction panel. Ideal for grinding and polishing of large parts. Modular structure – several SVP can be combined for increased capacity. Requires fine filter and extraction fan. 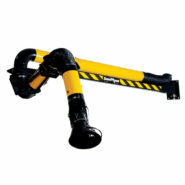 Our top selling extraction arm for welding fumes, oil mists, dusts and similar pollutants. Available in different lengths. 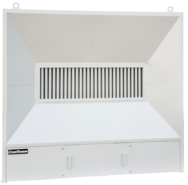 Professional welding downdraft table with filtration system. 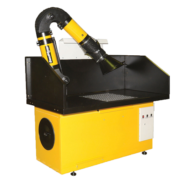 Equipped with extraction arm, protection screen, luminescent lamp, turning table for small parts and adjustable legs. High capacity mobile self-cleaning filter. Suitable for one/two non-stationary welding posts. Built-in air compressor serving the automatic self-cleaning system. Outstanding reach and flexibility. 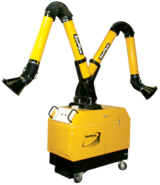 Console mounted extraction arm for welding fumes, oil mists, dust and similar pollutants. Stationary dust collector for grinding and sharpening machines. 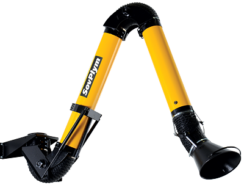 Cyclone and effective filtration system ensure high filtration efficiency. Equipped with manual filter cleaning system.